Orbital mechanics is a cornerstone subject for aerospace engineering students. However, with its basis in classical physics and mechanics, it can be a difficult and weighty subject. 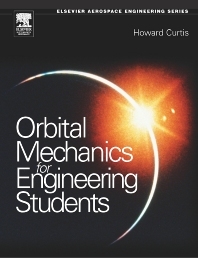 Howard Curtis - Professor of Aerospace Engineering at Embry-Riddle University, the US's #1 rated undergraduate aerospace school - focuses on what students at undergraduate and taught masters level really need to know in this hugely valuable text. Fully supported by the analytical features and computer based tools required by today's students, it brings a fresh, modern, accessible approach to teaching and learning orbital mechanics. A truly essential new resource. Undergraduate students in aerospace, astronautical, mechanical engineering and engineering physics. Widely applicable to taught Masters level courses in similar subjects. Ideal for courses in orbital mechanics, including astronomy, cosmology, general mechanical engineering courses with options in space or satellite engineering, and various mathematics disciplines. Related professional aerospace and space engineering fields. Space, rocket and satellite systems engineering form key divisions of most major aeronautical groups, including organisations such as NASA, the European Space Agency, and commercial organisations such as Boeing, BAe Space Systems, etc.